Noted analyst Gene Munster is predicting that Apple's initial entry into the augmented reality wearables category will be a year later than previous reports have estimated. The managing partner at Loup Ventures published a report on Thursday regarding Apple's new product categories, covering his assessment of the current technology landscape as well as public perception of wearables for an extended timeline for Apple's smartglasses product. "We are pushing back our expected release of Apple Glasses from September of 2020 to December of 2021 based on recent meetings with several AR industry experts." wrote Munster. "While these people do not have direct knowledge of Apple's plans, it is becoming clear that, as a category, AR glasses are a few years away." REALITY BITES: According to DigiDay, the cost for Snapchat's AR Lenses for advertisers have dropped from upwards of $1 million per day to about $40,000 per day plus cost per million impressions between $8 and $20. This could help stoke interest in AR marketing, or it could be a signal that some are still chilly on the idea of immersive promos. Waveguide manufacturer DigiLens has closed a $25 million Series C round of funding from automotive technology company Continental, which uses the technology in its heads up displays. Along with its previous investment in DigiLens in 2017, Continental holds an 18% stake in the company. Thorsten-Alexander Kern, head of HUD product development for the Instrumentation & Drive HMI business unit at Continental, will also join DigiLens board of directors as part of the funding deal. REALITY BITES: Cortney Harding, head of VR/AR creative and strategy at Friends With Holograms and adjunct professor at NYU, predicts augmented reality will eventually make billboards obsolete. 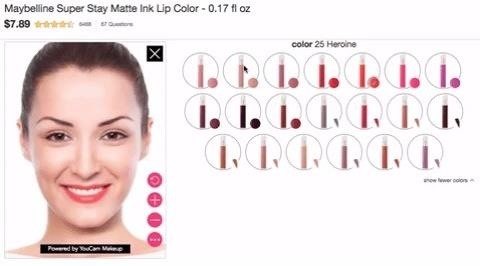 For its Beauty Studio web app, Target uses the YouCam platform offered by Perfect Corp. Available through Target.com via any desktop web browser, as well as mobile (specifically, Safari for iOS and Chrome for Android), shoppers can try on 88 products, such as lipstick, eyeliner, blush, and more, from 10 brands, including Cover Girl, L'Oreal Paris, and Revlon, among others.